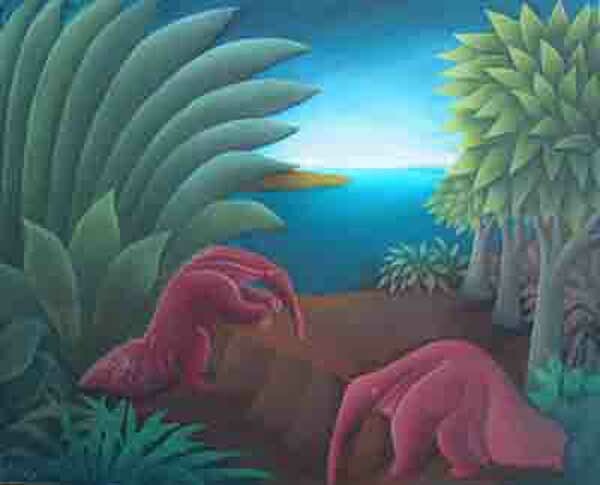 Roland Blain was born on June 30, 1934 in Port-au-Prince. He was a member of the Foyer des Artes Plastiques, the organization of modern artists that broke away from the Centre d'Art in the early 1950's. He began his studies with Joseph Jacob there in 1959. He was also a professional musician for a decade, during which he abandoned painting to play the trumpet and form his own orchestra; He did begin painting again around 1969. The Roland Blain show at the Galerie Monnin in 1976 was the talk of the town, a sensation. 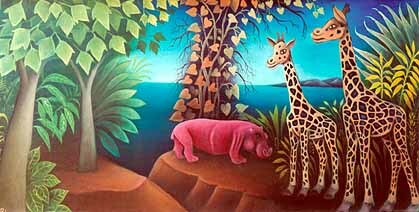 The paintings were populated with surreal pink and purple zebras, kangaroos, anteaters and mermaids. 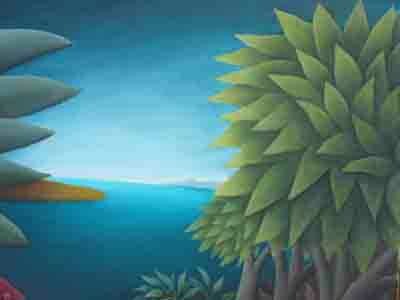 He began losing his eyesight in the late seventies and could no longer paint. His paintings are rare and wonderful. Roland Blain passed away on July 18, 2005 at 8pm in Brookdale Hospital in Brooklyn.